Blazing Hot Wok: Weekend Wokking Vinegar! It's time for the Weekend Wokking round-up and we're showcasing vinegar! It was awesome to receive such a variety of submissions using the theme ingredient. Thanks to all for participating and let's get started! 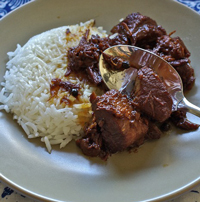 Pork Adobo submitted by Javaholic. Pork fans, rejoice! Pork simmered in a sauce of coconut vinegar, soy and fish sauces and a healthy amount of garlic. Drooooool! 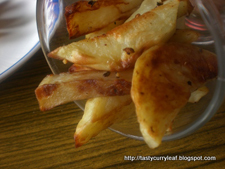 Balsamic Roasted Potato Wedges submitted by TastyCurryLeaf. Need zing? A splash or two of balsamic added at the end roasting is a nice way to dress up humble potato wedges. 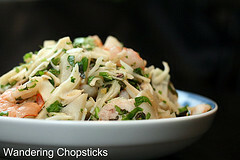 Goi Mit Non tom Thit Heo (Vietnamese Green Jackfruit Salad with Shrimp and Pork) submitted by Wandering Chopsticks. Never tried green jackfruit? Well here's your chance! It's tossed with shrimp, pork and a Vietnamese dipping sauce or fermented anchovy sauce. Fagiolini aglio e aceto (French beans with garlic and vinegar) submitted by Urban Bites. 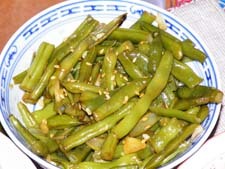 A simple and delicious way to enjoy your green beans. 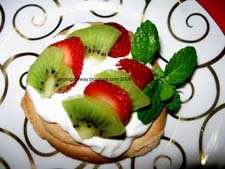 Mini Pavlovas submitted by MomGateway. What's better than this light and airy meringue dessert? How about the cute and elegant mini version! 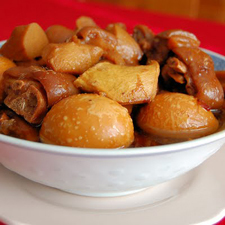 Pig's trotters with ginger and vinegar submitted by Kits Chow. There are very few things better than slow cooked pork, especially trotters and hocks. These trotters are simmered in a slow cooker with black rice vinegar and brown sugar. I can only imagine how divine this tastes ladled over steamed rice. 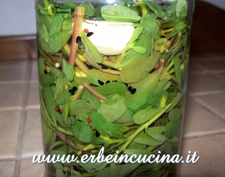 Pickled green purslane submitted by Erbe in Cucina. Okay, I admit I'm ignorant when it comes to purslane but I do love all things pickled. Now I've got my eye out for it. 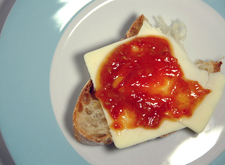 Tomato Jam submitted by me. Okay, nine tomato plants may have been overkill, but at least I found a delicious way to use up all those pounds of tomatoes I harvested this summer. Thanks again to all who submitted! For the next theme ingredient, let's do cabbage. Oh, I know you're as excited as I am! If you're itching to join in, read over the rules then send your submissions to Graziana of Erbe in Cucina at scrivi(at)ilmeglioincucina(dot)it by 11:59 PM, Sunday, November 1st. I love the variety of dishes that we got for this roundup. Vinegar in dessert? And I do love my pickles. Thanks for organizing this roundup. Another nice round-up. I love the variety of recipes you were able to get for the challenge. Argh! We mnissed it again!!!! Nice roundup. Thanks for pulling it all together. The range of dishes is impressive. OMG...My mouth is watering just thinking about all these amazing recipes! My personal favorite is always adobo, I make mine with white vinegar, soy sauce, and garlic but am intrigued by the recipe here. Oh...I just can't wait to try out all these yummy treats! WC, my pleasure! these events are what's keeping me going right now. Otherwise, I'd find little time for blogging. TS, you're usually submitting 2 or even 3 recipes! Oh well, there's cabbage to look forward to! Jason and manggy, the adobo is certainly getting people's attention. It's been mentioned in a couple of private messages. And manggy, I am 100% positive you can come up with something for cabbage. It can be any type of cabbage. As they say in teacherspeak "put your thinking cap on!" I am also drooling over that pork adobo. I've never tried it with coconut vinegar before though. Sounds delicious.